Are Cancer women Libra men a good match mentally, emotionally and sexually? The Cancer woman Libra man can be an exciting pairing. While she is more fluid in her emotions, he is airier in his opinions so that they will approach the same issue differently. They do make good partners. But he appeals to her softer side, and she appreciates his mindfulness. The Cancer woman Libra man union doesn’t boast of an excellent love compatibility but with some effort this relationship can work out. Both the Cancer woman and Libra man admire their mate’s intelligence and critical thinking, but they each use it differently. This will either keep them apart or bring them closer together, depending on whether or not they are willing to learn from each other. Dating a Cancer woman can be a new experience. The same goes for dating a Libra man. The one area the Cancer woman Libra man differences are complementary is in the bedroom. The Libra man sexually is more passive than his Cancer mate, which works well because she doesn’t mind taking the lead in sexual matters. In fact, this is one aspect of their relationship that will bring things to a whole new level. Read about Cancer woman sexuality. The Libra male in love is romantic while she is sensual, which creates a great match between the sheets. The Cancer woman is very feminine which appeals to his male charm, and he makes her feel loved and protected. She finds the stability she is looking for, and he receives the ultimate care that he desires from a partner. His mental stimulation doesn’t require a lot of physical prowess, and neither does her emotional need. The Cancer woman Libra man are able to enjoy the simple affection that each person offers, without feeling empty or wanting of anything other than the beautiful union they create. The male scale craves balance, which will be the first obstacle this couple will have to overcome. The feelings of the female crab change with the tides, and it will be difficult for him to maintain a sense of calm during one of her emotional outbursts. But the Libra male also has trouble making up his mind, because he needs to look at both sides of every issue before deciding on the right course of action. The Cancer woman can appreciate this aspect of his personality because she is also a deep thinker. However, she is guided by her pure intuition, which means she sees things quicker than her Libra counterpart. The scales will then tip toward her being annoyed by his indecision. But outside of the bedroom is another matter for these two sun signs, and the mix of watery Cancer and airy Libra may create gloomy weather. While the Cancer woman and Libra man both enjoy comfortable home life, she will be stuck with most of the housework as he can’t be bothered with such trivial matters in this Libra compatibility. This will drive her crazy, as she strives to maintain order in their lives. While Libra men need balance too, that simply means the Cancer women will be the one to take care of that side of things. This kind of attitude may cause a divide between them, making her retreat into her shell to skulk over his selfishness in this Cancer compatibility. The Libra man will find this boring and may not even be interested in resolving the issue. Their day to day relationship will require the most attention, especially with his easygoing manner and her sensitive nature. He may come off as aloof to her, and the Cancer woman in love will seem hysterical to him. 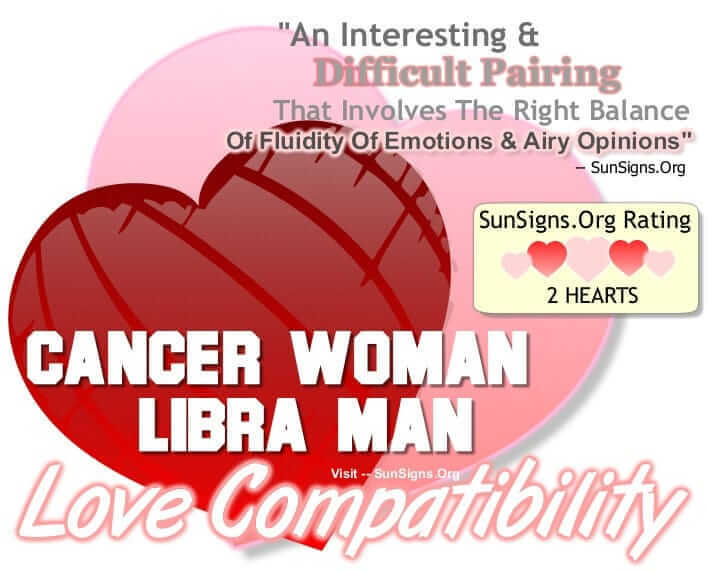 Cancer is a cardinal water sign whereas Libra is a cardinal air sign, the Cancer woman Libra man compatibility gets a TWO Hearts rating. It will take a lot of communication and compromise for the Cancer woman and Libra man to overcome their fundamental differences. But if she can give him space he needs to figure things out for himself, and he offers her the security she wants, their love life together will go far. Compromise and communication are essential for this love match.